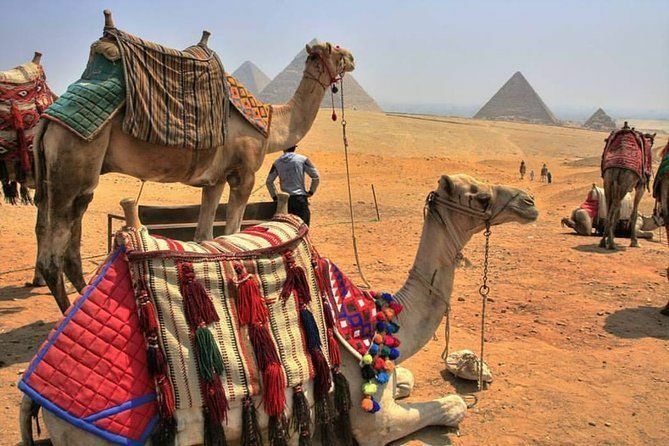 When you join this tour you will have chance to see highlights of Turkey Greece and Egypt, explore ancient wonders and local culture of Mediterranea. 02 Nights in Istanbul 4* hotel with breakfast. 02 Nights in Cappadocia cave hotel with breakfast. 02 Nights in Kusadasi 4* hotel with breakfast. 01 Night on overnight coach from Cappadocia Pamukkale..
02 nights Mykonos, 4* hotel with breakfast. 02 night Santorini 4* hotel with breakfast. 02 nights Athens, 4* hotel with breakfast. 02 Nights in Cairo 5* hotel with breakfast. Domestic Flight Cairo / Aswan - Luxor/Cairo. 03 Nights on board 5* deluxe Nile cruise full board from Aswan to Luxor. Domestic flight Istanbul / Kayseri. One way flight from Izmir to Mykonos via Athens. One way flight from Athens / Cairo. Mykonos to Santorini ferry, economy class. Santorini to Athens ferry, economy class. Gratuities for Driver & Guide. some hotels don't accept triple rooms in that case you should pay single room supplement for the third person. Day 1: Arrival to Istanbul (Meals: No) Overnight in Istanbul. Day 2: Historical Istanbul Tour (Meals: Breakfast+Lunch). Overnight in Istanbul. Day 3: Bosphorus Cruise / Fly to Cappadocia (Meals: Breakfast)Overnight in Cappadocia. Day 4: North Cappadocia Tour (Meals: Breakfast+Lunch) . Overnight in Cappadocia. Day 5: South Tour /Pamukkale / Flight to Kusadasi (Meals: Breakfast+Lunch)OPTIONAL: An hour hot-air balloon ride available this morning with extra cost , Overnight hotel stay in Kusadasi. Day 7: Ephesus & House of virgin Mary tour (Meals: Breakfast+Lunch+Dinner). Overnight in Kusadasi. 07:10 AM Arrival to Athens Airport and wait for the next flight. 08:25 am, depart on connect flight to Mykonos. 09:00 am, Arrival Mykonos, meet at the airport and transfer to hotel. Day 9: Free in Mykonos (Meals: Breakfast). Overnight in Mykonos. Day 11: Free in Santorini (Meals: Breakfast) Overnight in Santorini. Day 14: Athens to Cairo (Meals: Breakfast)Breakfast, check out from hotel and transfer to Athens airport for flight to Cairo, arrival to Cairo, meet and transfer to hotel and check in. Overnight in Cairo. Day 16: Flight from Cairo to Aswan – Aswan tour – Nile Cruise [B, L, D]overnight on board. Day 19: Flight from Luxor to Cairo - Cairo City tour [B, L]After breakfast, disembark, Transfer to Flight from Luxor to Cairo, Overnight in Cairo. Day 20: Departure [B]After breakfast, check out for transfer to Cairo airport for flight back home. New Year Gala Dinner or Xmas Eve dinner (it is compulsory at most of the hotels).